Milan is not only the biggest industrial city of Italy with many different industrial sectors, but it is also a hub for Italy's world-class design, fashion, food and precision-manufacturing industries. Milan is one of several cities in Europe hoping to pick up some of the spoils should London's financial institutions shift their operations elsewhere post-Brexit. The city is already Italy's financial hub. It is home to the country's main stock exchange and Bocconi University, one of the top-rated universities for business and finance in Europe, which help provide a pool of talent. Milan is also a global fashion capital, with world-class shopping centred on the glossy Quadrilatero d'Oro: have you ever heard about Via Montenapoleone? Male and female fashion weeks take place, which pioneered the concept of fashion-themed hotels and restaurants, including venues tagged by Armani, Bulgari, Gucci and Dolce & Gabbana. Expo 2015 fair brought 21m million visitors to the city and was a catalyst for infrastructure projects. A fourth Metro line was completed while a fifth will be ready at the end of 2018; areas such as Navigli, the canal district, received a much-needed facelift. You can't miss the night life along Navigli canals, with all restaurants offering every kind of food! We would like to introduce this time latest trend, dramatic change which appears upon in Milan and traditional Milan culture. When people think of European town, historical townscape, mainly impressive European architecture, often come to mind. However, the townscape of Milan dramatically changed last 10 years. The building that has become the leitmotif for this change is a skyscraper 1km to the east of the city centre on a former industrial site badly bombed during the second world war. From almost anywhere in the city you can see the glinting pinnacle of the 231-metre UniCredit skyscraper by César Pelli, which is the centrepiece of Milan's Porta Nuova development. Named after one of the ancient gates into the city, the entire development of 25 commercial, residential and office buildings with an estimated value of €2 bilion, was sold to Qatar in one of the biggest property deals ever in Italy. 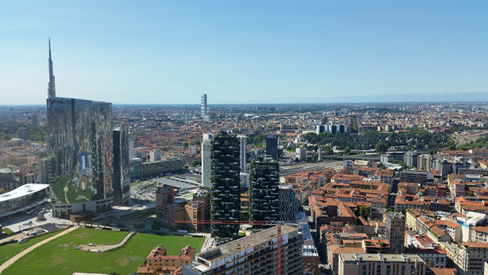 The image of Milan skyline has now shifted from the spire of the Duomo to the spire of Porta Nuova's skyscraper. There are other distinctive buildings in this district. Swaying high above Porta Nuova is the Bosco Verticale, or "vertical forest" — two high-rise apartment buildings where every balcony is covered with trees and plants and recently copied in China, too. In a city long dismissed as grey and full of concrete, it is a disarming shot of nature. "Aperitivo" means aperitifs in English. However, "Aperitive" is known all over the world as a style prior to dinner. Do you know the untold story behind this traditional style? Milan is also the city of "Aperitivo". In the late 1860s a farmer's son named Gaspare Campari invented it! At that time Milan was steadily affirming its position as a power player in the recently unified country of Italy. Scores of people from the countryside were flocking to the city to find wealth in this industrial paradise. Economic prosperity pushed middle class to show their style. Mr. Campari, after beginning work at the Bass Bar in Torino aged 14, and after much observation of his patrons, he became fascinated by people's drinking habits. He noticed how many alcoholic aperitifs spoiled one's appetite prior to eating, so he began mixing the drinks for people to enjoy before their evening meal. His choice of location, in the shadow of Milan's Duomo, was favoured by the Milanese intelligentsia and Campari's bitter, became their drink of choice. This peculiar crimson coloured cocktail was sour in taste and designed to stimulate the appetite. His recipe contained more than 60 natural herbs, spices barks and fruit peels and is still the Campari company's treasured secret. Today still Milan people keeps the tradition and all bars compete to offer the best finger food while having an "Aperitivo". Public transportation, particularly Metro, was not organized well. You just leave cars shared where you would like within the service area because Milan is unique city where you can park almost everywhere. *Public roadside consists of Yellow Zones (resident zones), Blue Zones (payment zones) and white Zones (free zones). ensure a full interoperability among all the different local services and operators (ICS 2003). Cities and regions were prompted by the ICS to launch Car-Sharing services. How the companies founded for this purpose were organised was left up to the local partners by the ICS. The advantage of this is that a close collaboration with the local provider of public transport and with local transport policy is built in from the outset. 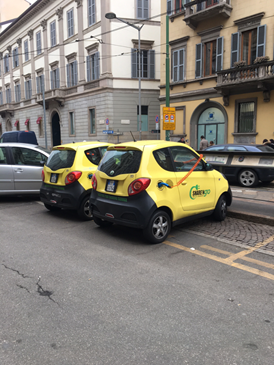 Access to Low Emission Zones and free parking in the "Blue Zones " of city centres as well as the use of bus lanes are privileges that Italian Car-Sharing users can take advantage of in all the cities. Within the limits fixed by the service standards, the individual local operators have autonomy in all the operational, commercial and managerial aspects. 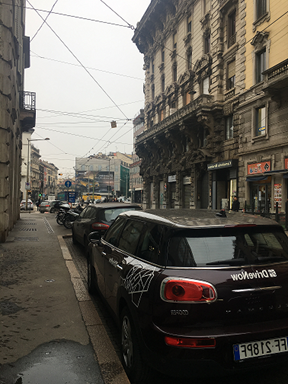 If you come to Milan for business or for leisure, you might decide to pay a visit to Porta Nuova area with its modern buildings while having an "Aperitivo" and if you will stay longer you might decide to use car-sharing instead of rent-a-car.